Beast has been a restaurant I’ve always had intentions of visiting, especially after following the Group of Seven Chefs, a collaborative pop-up dinner team started by Chef Vivian. People rave about the Beastwich, a towering buttermilk biscuit holding fried chicken, cheese, a fried egg, potatoes and then smothered with gravy. Offered only during Sunday brunches, it sounds delicious but seems a bit heavy for the first meal of the day. On a cold winter night I finally had that chance to try their creations. Tucked away on a quiet residential street (Tecumseth) near King I first feared that Googlemaps had led me astray. Luckily, it was correct and soon was seated in a warm and casual dining room. My only caution is you may want to make Beast the only stop of the night as it’s a bit poorly ventilated so you will reek of food afterwards. Beast’s menu consists of small plates that meant for sharing. Jeff, our fantastic waiter for the night, gave us plenty of time to peruse it as so many things sounded delicious. We finally settled on six dishes for our table of three. 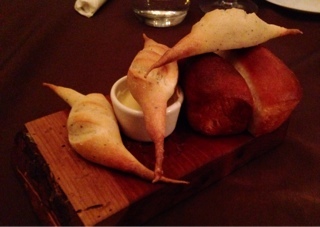 Before they came out, we were presented with a platter of some interestingly shaped bread, where the horn shaped ones acted as a roll and bread stick in one (on account of its crunchy ends). The steelhead trout ($12) arrived first. Lightly smoked and flaked apart, the fish was served cold on top of slices of sweet beet root and flavoured with dollops of thick yogourt and chives. 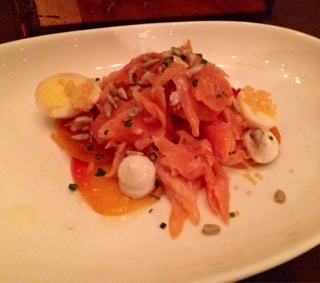 I enjoyed the trout’s texture and strong but not overwhelming flavour. The beetroot actually helped to mellow out the smokiness a bit and I wish there was more of the delicious creamy yogurt to go with it. In my opinion, the sunflower seeds could have been left off as they added little to the dish and got in the way of the delicate flakiness of the fish. 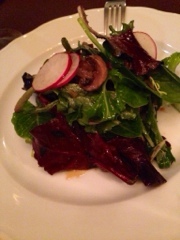 Meanwhile, the mixed greens were less impressive and priced at $10 needed a bit more than a handful of spring mix topped with a button mushrooms and radish slices. Sure the sweet balconville dressing (a late harvest apple vinegar) was good and each leaf well coated. But, it wasn’t that outstanding to make it a worthwhile repeat order. Alas, it’s likely our own fault … when you go to a restaurant called Beast should you bother with vegetables? 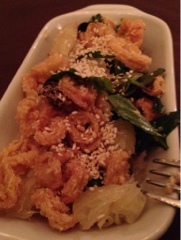 The Asian inspired fried squid ($11) was much better. I liked the addition of the Thai basil and pomelo (a sweeter and drier grapefruit) which lightened the dish. The battered squid was nice and fresh, albeit in very small pieces on account to the size of the squid used. But, the tinier pieces did make it easier to combine forkfuls of all the ingredients so you could really taste everything holistically. 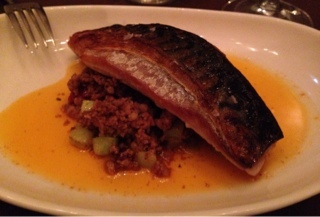 Our last seafood dish was the mackerel ($13) cooked beautifully with crispy skin and flakey meat. A tomatoy chorizo and cucumber mixture added a nice saltiness to the fish and a Spanish flare. Overall, I was pleasantly surprised with how well Chef Vivian prepared fish considering Beast is known for its meatier fare. Yes, hunks of soft meat and crispy nuggets are good, but dish after dish of it would be too much. Sometimes you do need a lighter seafood added to the mix to really appreciate the differences. 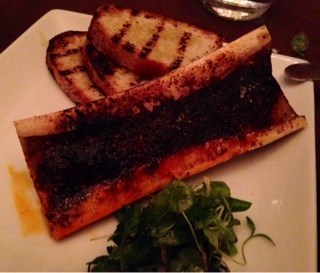 A dish that certainly turns heads is their bone marrow ($12), a hunking beef bone cut in half with a deep char on top. That nice crust comes from adding sugar to the top and then blow torching it to create a nice brulee topping; the slight smoky sweetness actually goes quite well with the soft marrow. 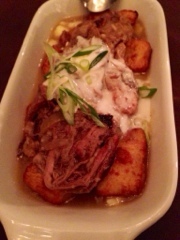 Personally, I preferred the marrow by itself as when eaten with the grilled bread the smokiness was overwhelming. Perhaps the dish would be better suited with simple toasted bread rather than the grilled version. Beast’s poutine ($10) replaces fries with fried pieces of soft gnocchi (on my!). The crunchy crust holds up quite well but is softened somewhat with the liberal topping of gravy that thoroughly melts the cheese curds. Tender braised pulled pork adds even more flavour to it. Although this sounds like a heavy dish, their gravy is a lighter jus so isn’t as gluttonous feeling. This is certainly a dish I’d order again! After six dishes we were satisfied. Nonetheless, we couldn’t help but peek at the dessert menu. With only three to choose from the choices weren’t much, but still sounded delicious enough that we had to pick between two. 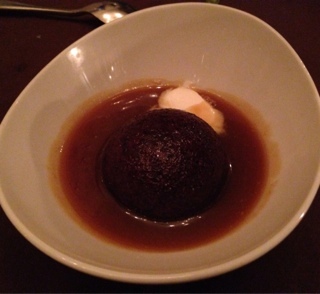 In the end, we opted for the sticky toffee pudding ($10) and it was such a great choice! When it arrived the sheer amount of toffee seemed ridiculous; the soft moist pudding was actually sitting in a pool of toffee. Even though it wasn’t overly sweet, you still had to eat it quick as near the end so much was soaked into it that it almost felt like toffee with pudding bits. I recall reading somewhere that Chef Caldwell use to be a pastry chef so this could have been one of her delicious creations. It was one of the best sticky toffee pudding’s I’ve ever had. At Beast you won’t find obnoxiously loud music that overwhelms your ability to carry a conversation. You will find dishes coming out at a good pace so you actually have time to savour each one and not feel rushed. Prices aren’t cheap but with the flavourful dishes we found we felt satisfied with two each so the bill ends up feeling affordable. Just don’t come with a vegetarian as I can assure you they will feel disappointed.